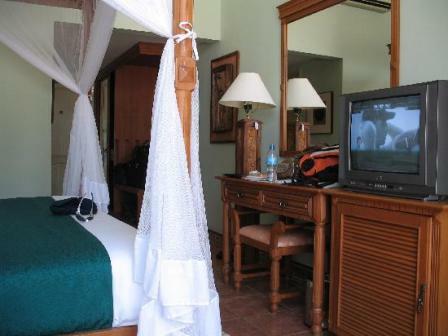 I've been dithering over how to rate Coral Rock Hotel in Zanzibar. Three point five would be perfect but is not an option, so am giving the place the benefit of the doubt with a four. There are a number of inconsistencies that with a bit more attention would make this place a true 4 and maybe even a 5. A day spent at Coral Rock is a day well-spent. That was the primary feeling we had after a two week stay in Zanzibar. Whether we spent the day snorkeling with the hotel's resident sea captain, 'Captain Chicken,' or taking a long walk on the sand-bar at low tide after a morning of reading by the lovely pool, it was hard to go wrong. We increasingly found ourselves planning the activities of our day based on high and low tide which, we decided, is a sure sign of a good day. The staff and management at Coral Rock- who you will undoubtedly get to know during your stay- are warm and friendly and have no trouble remembering that you don't like tomatoes or suggesting the coldest beer on offer. The hybrid bar/restaurant/internet cafe is the literal hub of the resort and surrounding area; it's precarious placement atop a rock protruding over sea will make you feel far from your own kitchen table as you sip your morning mango juice. If you want pretension and someone to clean your sunglasses for you, then this probably isn't the place to go. But if you want a laid-back, shoes off vibe, with friendly staff, fresh fish and reggae music wafting from the speakers, you'll be stoked at Coral Rock.